NOTE: This page is about Palu Island in Second Life. The InWorldz version is here: Palu Island in InWorldz. 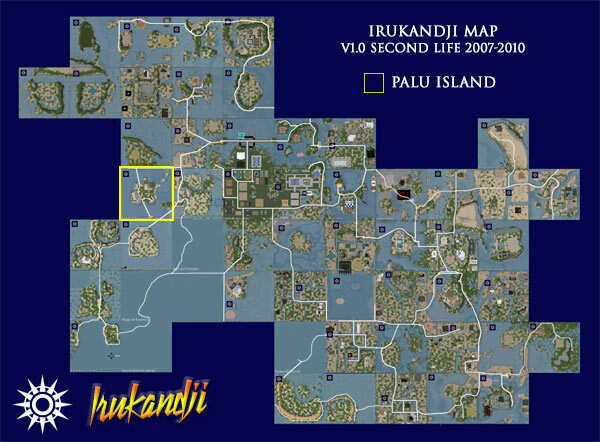 Palu Island, in its original incarnation in Second Life was a light residential sim in Kalamat State in farwest Irukandji. As with the other islands in Kalamat, timing was not on its side, as the GFC hit just a few weeks after Palu Island came online. This is one of a handful of examples where the later InWorldz version of an island was far more successful, and memorable, than the Second Life version. Palu Island was surrounded by sims on six sides; Mantaray Shoals, Coraki Lagoons, Aquitaine Bay, Baie de Triomphe, Rainbow Reef, and Sunset Shoals. No photographs remain of Palu Island. If you happened to have taken photos and wish to share them, please let me know.